George Orwell and Aldous Huxley were two writers who initially established themselves not only in the world of realist fiction, but also as effective observers on society. As a result, their later novels Nineteen Eighty-four and Brave New World are heralded as two of the greatest science fiction novels ever written, with literary purists even willing to make allowances despite the sci-fi leanings. 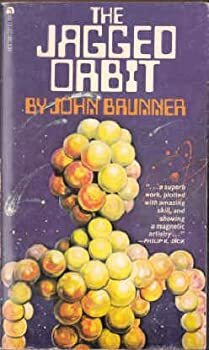 Perhaps it is John Brunner’s misfortune that his career was established in the world of science fiction. When Stand on Zanzibar was published in 1968, only those within the genre took notice of its qualities. As poignant literature that transcends genre, it too comments with profound relevance on the human condition. Breaking into the business with Silver Age space opera but putting himself on the map by writing intelligent dystopia with a social conscience, for a brief moment John Brunner put aside science fiction and dabbled in fantasy. After the success of Stand on Zanzibar, The Jagged Orbit, and The Sheep Look Up, he wrote the four novelettes starring the other-wordly traveler in black. Unconventional to say the least, the eponymous collection is fantasy without being fantasy. A wizard (of sorts) may be the common thread binding the stories together, but humanity is at stake. The novelettes thus embrace the general idea of genre, but eschew its epic-ness in favor of parables.